Many dog owners grow weary of their dog's breath but they may not realize that bad breath could be a sign of a more significant dental problem. In order to maintain your dog's oral health, regular brushings and veterinary visits are critical. Indeed, brushing your dog's teeth is about more than just fresh breath; gum disease is an increasingly common condition in dogs that is easily preventable with regular brushing. So how do you brush your dog's teeth? Preferably, you want to brush your dog's teeth daily. Unfortunately, this often seems like a difficult task for dog owners so most veterinarians recommend brushing at least 3-5 times per week. But if you have not been brushing your pooch’s teeth at all, any brushing will be beneficial but you should try to make it a regular activity. 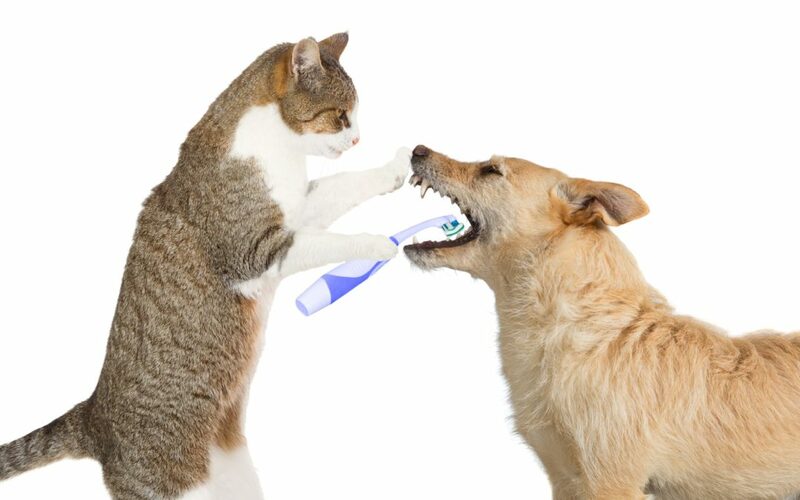 Before you try to brush your dog's teeth, you'll need a few tools. You may either use a toothbrush specially designed for dogs, a small finger brush, or other specialized tools. choose the product that you feel comfortable using. You will also need a special toothpaste that is formulated for dogs and is available in a variety of flavors. All of these products can be purchased from your veterinarian or some pet stores. Do not use toothpaste designed for humans as dogs are likely to swallow the product during brushing and this may result in gastrointestinal problems. Your dog may initially be uncomfortable with having his teeth brushed so take your time. Introduce the toothbrush and toothpaste gradually so your dog becomes familiar with them. Also, in the early stages, reward your dog with a treat after brushing so he learns to associate brushing with positive experiences. You may consider trying different tools (dog toothbrush vs. a finger brush) until you find one that your dog will accept. 1. Put some toothpaste on the toothbrush. Place your free hand on top of your dog's snout and gently lift his lips. Brush the exposed teeth and gums, gradually lifting his lips to reveal more teeth that can be brushed. You may want to brush for only a short period at first, and then gradually brushing for longer periods as your dog is more comfortable with the procedure. 2. Next, gently open your dog's mouth by holding your free hand over the top of his snout. You'll carefully pull his mouth open so you can brush his lower teeth. You should carefully brush both the outer and inner surfaces of his teeth. 3. If your dog struggles during brushing, take a break. Always reward your dog for appropriate behavior during brushing so he will grow to tolerate (if not enjoy) the activity. If you're having difficulty brushing your dog's teeth, consider making an appointment with your veterinarian. He or she will be able to demonstrate the proper brushing technique and can help your dog obtain good dental hygiene.